and i didn't even screw up the measurement calculations; the skein is a lovely 27" long. if its worth doing, it's worth overdoing. actually made it out of the house today, and went to two (!) events. first the local fibre festival at the conference centre, a new offering. 25 vendors, and i bankrupted us buying fibre and yarn. mostly fibre: tussah silk, flax, romney/opossum, dyed romney/mohair, chiengora (the name cracks me up; it's the undercoat of samoyed dogs), mohair locks, silk hankies, dyed silk noil, and an entire shetland fleece. yarn: lorna's laces shepherd sock, unwind yarns nebiolo (a sport weight merino/suri alpaca), diamond's alpaca baby lace, and a 100% silk lace distributed by fun knits on quadra island (dirt cheap; C$ 9.95 for 500m). weirdly enough our local yarn store was not represented; when i was visiting them yesterday they complained that they found out about the event from a random customer. seems the publicizing was directed primarily at spinning/weaving suppliers more so than at knitting stores, and the LYS has just started to carry a wee bit of fibre. that was short-sighted, because the show had a lot of yarn as well, and the LYS would have beaten the drum for them. i'm hoping this will become an annual event. when carting my treasure home i listened to the radio, which was broadcasting from the cowichan fair, and since the paramour was amenable, we headed down island to check out the brandnew exhibition grounds. very nice. we had some mennonite sausage, which was yummy, and some frozen lemonade, watched a driving class (mmh, draft horses), ambled through the poultry and sheep barns, and looked at the crafts. it's interesting how widely the craftsmanship varies in some of the categories -- the quilts were fabulous; first class, as was the weaving, but the crochet was terrible, and the knitting mediocre. i took lots of quilt pictures; i'll share some of them tomorrow. it also amuses me just how detailed some of the categories get. my favourite one: 1706 NEWCYCLE, a design using roadside plant materials in a recycled container. chatted with a lady who was demonstrating bobbin lace (this is NOT something i will ever do), and one with a nice 8-harness foldable tabletop loom (i think it was louet's jane). *lust*. we were both flagging by the time the rain moved in, and headed home early. now i am back to mainlining tv shows (damages and true blood) while fondling my new fibre. and to reward myself, i went go my LYS (mad about ewe), and bought some more yarn. OMG, handmaiden silk lace! i've mostly fallen off the wagon of productivity, *sigh*. continuing experiments in bread baking have resulted in very yummy french bread -- i am mixing bread flour and pastry flour, letting the bread machine do the kneading, and baking it in the oven, spritzing it with saltwater. perfect crumb with just the right size of holes, great chewy crust, and all of that without the hard labour. it also seems to not take so long, which is entirely subjective -- it does take just as long, but having to do less work makes it seem like less time. the sock experiment (with the tunisian crochet heel and toe) did not go so well. the heel and toe themselves worked out well, but i can't believe i was so stupid to use a variegated yarn for this -- that creates of course discontinuities where the crochet and knit part are sewn together. also, the yarn that i was using -- elann's esprit "sock it to me!" (98.3% cotton, 1.7% elastic) is way, way stretchier than i am used to, and consequently the sock i ended up with has a nice, thick, solid heel and toe (the heel fabric is pretty much perfect; just enough give), and a terribly slouchy everything else. i like the yarn, it feels great when working with it, and it's nice on the skin. but when using it i'll need to completely overhaul any pattern i have, to take into account that stretch that won't quit. went to michaels today to get a new crochet hook, since my 4.0mm one disappeared on me during the montreal trip. also wanted to check out their new yarns, since i had already drooled all over my LYS. turned out they had some new patons, and i got a few sample balls. patons pooch (63% acrylic, 27% wool, 10% nylon), colour "lamb"
patons SWS (70% wool, 30% soy), colour "natural pink"
patons cici (68% acrylic, 32% nylon), colour "starry night"
whoa, the colour balance is off terribly, still. i really need to create a new usermode on my camera to deal with the changed lighting in my room. just imagine the background and the left bottom ball to be pure white, *sigh*. i really like the soy/wool blend, it comes in a number of nice colours -- i'm not usually into pink, but i actually like this soft off-white -> pink -> green colourway. i'm gonna knit up a swatch to see how it'll felt. it's a single ply, so that alone will make it considerably different from my standby patons "classic wool", and we'll see about the soy. the "be mine" is another 100% nylon one which means it'll dye superbly and be great for people with wool allergies, and for cancer caps. also bought a spiffy new spoolknitting toy, a wonder knitter (though mine is not that obsessively pink). good for fast i-cords! i am mostly gonna use it for wire. the *poing* left for the long autumn vacation today. *sniff*. and the paramour is gonna leave this weekend for 2 months with LMPS in burbank, so soon i'll be all alone. maybe i'll get my room cleaned up and remodelled this time. oh, and i kicked mozilla to the curb. welcome back, opera, my dear. aaand, as some of you already noticed, i'm back in alt.poly, and no longer through google. :) i might check back in ssm as well. this is the yarn i am taking with me. it'll be a freeformy something of spirals and sprays; maybe a long vest. freeform is ideal for the bus; lots of small pieces as the mood strikes me. the colours are not quite right; the white balance was off under the light in my office and i didn't notice until i had taken the battery out of the camera for recharging. and now i am too lazy to fiddle with the gimp. i'll take another picture tomorrow in daylight. everything is slightly more cyan-shifted in reality, and the reds are not quite as intense. to get away from the decision about the wasps, i drove down to duncan today, to the tiny, packed to the rafters yarn store run by a dutch woman, because i wanted to get my hands on a proper drop spindle instead of fiddling with my homemade one -- just to see what it should feel like. she only had one, and it's a bit on the large side, but since it's by ashford, and a high whorl to boot, i am happy with that. it's 3.5" diameter and weighs 2.76 oz. even more happiness resulted from the 8-pound bag of dark brown sheep fleece she had sitting outside for C$20. OMG. it's nice, soft fleece too, though she didn't know what breed. i'm thinking maybe shetland, though that would be an unbelievable bargain -- 4.5" staple and nicely crimped; about 7 crimps per inch, ends not a whole lot lighter -- unwashed, but very little cruft in the fleece. it might be some kind of crossbreed. so here i am sitting, spinning in the grease, straight from the fleece; i've only picked out a few bits of straw. wow, this really is nice. 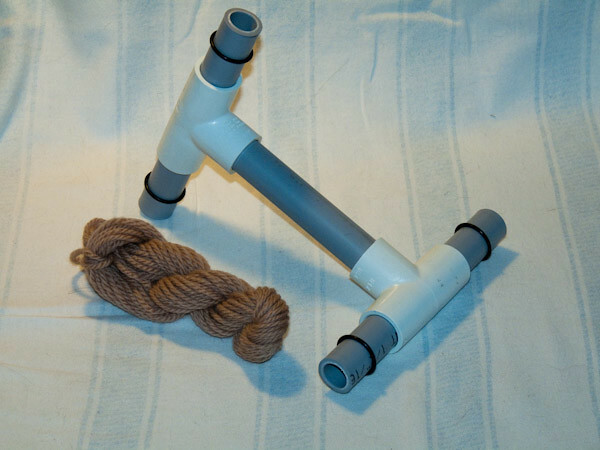 the spindle is heavier than my homemade one, and the lanolin makes the yarn glide very nicely. i'm already spinning a more even size, after just 10 minutes, and without preparing the wool at all. mmmh, i love the smell of sheep. whirly, 51% Nylon, 27% wool, 22% acrylic, lovely colourways, and soft goodness that does not look like it'll pile immediately and turn to crap. but i didn't buy to test. tempted, though. might go back. foxy, eyelash, shiny 100% polyester, but soft! softer than lionbrand's fun fur. i bought a skein of this in "lipstick" (which i'd call 'cerise' instead), and crocheted up a skinny scarf in a couple hours. 50g run for 82m (89yd) and it very fluffy even with just one strand. 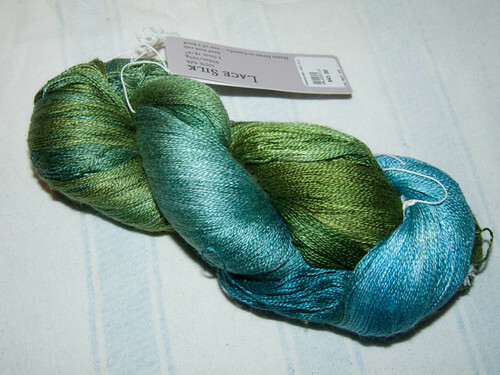 that link doesn't have this colourway, and they can't take photographs, but at least the colourways they do have look true to the skeins i saw. kiss, 2-ply 4 cm long eyelash with a central papery yarn, 100% nylon with the associated super-softness. 50g run for 76m (83yd). bought a skein in "flame" but haven't swatched it yet. i just want to cuddle with this one. speaking of people who can't take pictures, i am one of those tonight; i tried 3 times to capture these red skeins, but no joy; i need to wait for decent daylight. there don't seem to be any decent pictures out there yet at all. oh yeah, people who're used to red heart prices will get sticker shock with this one; it's a whopping C$8.87. tiki, ribbon with little "butterflies", 100% nylon. 50g run for 143m (157yd). nice watercolours. didn't buy this one either yet.